What's on this month at The Travellers Joy! We've got a Festive months coming up here at The Travellers Joy! Saturday 15th - Dean's 'Shite Night' and Disco, 9pm till late! Join us for some cheesy tunes and wear your worst shirt! Come along for a sing song and stay for some amazing prizes! 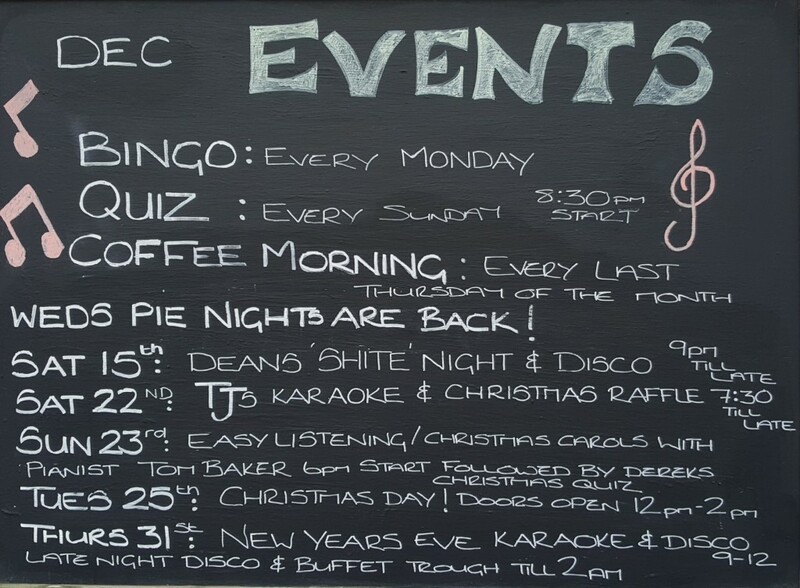 Sunday 23rd - easy listening tunes and Christmas Carols performed by pianist Tom Baker followed by Derek's extra festive Christmas quiz! Tuesday 25th - Christmas Day! Our doors will be open 12:00-2:00pm! Come and have a drink while the Turkey's in the oven! Thursday 31st - New Years Eve Party!! Free Entry with Karaoke and Disco 9pm - Midnight and a late night Disco and Buffet through until 2:00am!! Free Pool Every Tuesday evening, Pie Night every Wednesday, Derek's Famous prize quiz every Sunday and our Community Coffee Afternoon 12pm-2pm on the last Thursday of the month!